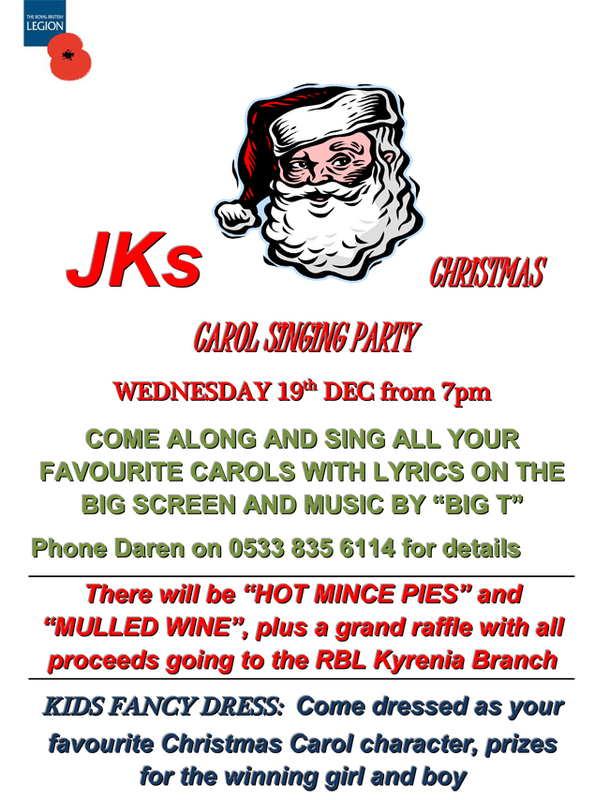 JK’s Bar & Restaurant will be holding their annual Christmas carol singing party on Wednesday 19th December from 7pm. There will be hot mince pies and mulled wine and kids are invited to come in fancy dress as their favourite Christmas Carol character and there will be prizes for the best boy and girl. You will be able to sing along to all of your favourite Christmas carols with lyrics on the big screen and there will also be music by “Big T”. This sounds like it is going to be a great evening. The proceeds from the raffle will be donated to the Royal British Legion, Kyrenia Branch, who have received an invitation from JK’s for RBL members to join in the fun. For further details about this event see the poster below or telephone Daren on 0533 835 6114.